South Asia is one of the least integrated regions in the world, with low intra-regional trade share. It barely stands at 5.38 percent in comparison to other sub-regions of Asia. Intra-regional trade stands at 36 per cent in the East Asian sub-region, 23 per cent in SouthEast Asia,8.97 per cent in Central Asia. 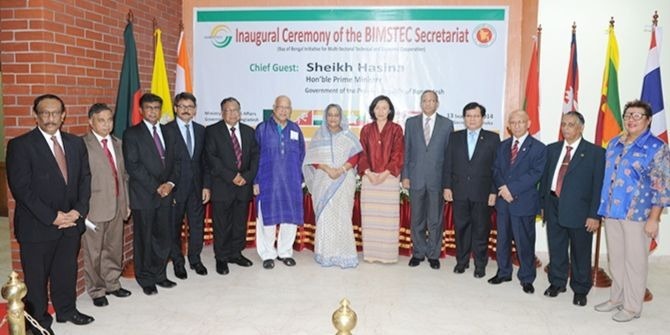 Formed in 1997, BIMSTEC garnered significant attention as an alternative platform for the South Asian integration. This is given that fact that there is predominance of South Asian countries in the group and absence of India-Pakistan contention. It is expected that BIMSTEC will generate lucrative results as a trade group so that non-members can understand the disadvantage of non-accession. The key driver for South Asian integration through BIMSTEC is the Free Trade Agreement (FTA), the framework of which was signed in 2004. The Framework Agreement on the creation of FTA specified well defined deadlines for various stages of economic integration. The FTA seeks to combine the economies of South and South East Asia, which are rich in natural resources and is home to 1.5 billion people. The combined GDP of the group is US$ 2.7 trillion. However, before BIMSTEC acts as an integrating platform for South Asia, there are certain challenges that need to be fixed. It has been 14 years since the Framework Agreement for the FTA was signed, and the FTA has already missed many deadlines set by the agreement. For example, Article 7 of the BIMSTEC Framework Agreement specifies that the negotiations for trade in goods will commence in 2004 and conclude in 2005. This has not happened. Similarly, the 2005-2007 timeline for talks on trade in service and investment has also gone by. For BIMSTEC intra-regional trade share remains low. It is merely at 5.98 percent (in 2016), which can be compared to SAARC, which has intra-regional trade share of 5.79 percent (in 2016). In comparison, ASEAN has an intra-regional trade share of 22.81 percent, while the European Union has an intra-regional trade share of 63.94 percent, depicting high level of dependence on members of the group. With a significant portion of the population employed in farming, agriculture remains the primary sector for most BIMSTEC countries. BIMSTEC region remains a net importer of manufactured goods from the world. While India, Bangladesh and Thailand are doing considerable trade in non-primary items like electronic component parts, garments and textile, their dependence on agricultural cannot be ruled out. Figure 1 shows the employment in agriculture (percent of total employment) of the BIMSTEC countries for two decades (1997, 2007 and 2017). Improved connectivity is crucial for economic integration in the region, while reducing cost of trade and increasing the availability of goods and services . It also helps with free exchange of ideas and is essential for regional prosperity. In 2005, the Asian Development Bank undertook a study to look at the infrastructure and transport aspect of the BIMSTEC members. The Bank identified 167 projects that will enhance the connectivity among the BIMSTEC countries out of which 66 were prioritised. One of the major suggestions which the Bank gave was to establish a Working Group on Transport and Trade Facilitation, which would be referred as the BIMSTEC Transport Connectivity Working Group (BTCWG). Till 2017, two meetings of the group have been held. The concern is the lack of contiguity: there are inadequate transport and connectivity linkages within a region. The region of BIMSTEC faces serious challenges in terms of the infrastructural bottlenecks. The table below shows a comparison of a series of variables that depicts that the region need to work out more concrete, fast and comprehensive plans to increase trade. Figure 2 | Source: 1 World Bank Logistic Performance Report 2016. 2 Global Competitiveness Index Report 2016. 3 Quality of Port Infrastructure World Bank 2017. 4 Linear Shipping Connectivity Index, UNCTAD, 2017. Blank space indicate that there were no data available. In the Logistic Performance Index, only India and Thailand get a place among top 50 countries of the world, while other BIMSTEC countries are quite low in their score. 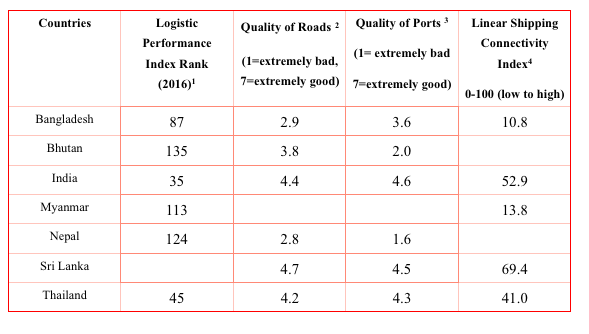 Similarly the quality of port and roads are not satisfactory as depicted by low score in the table. Most BIMSTEC countries (except for Sri Lanka, India and Thailand) score poorly on the Linear Shipping Connectivity Index (indicating how well a country is connected to global shipping networks). The BIMSTEC FTA has number of constituents; to name a few the FTA includes agreement in goods, service, investment and trade facilitation. It is imperative for BIMSTEC to prioritise the finalisation of the FTA, which is expected to generate propelling effect to develop high quality infrastructure for cross-border trading, regional value chains and employment opportunities. The FTA will also open up scope for investment in the region, which is at present very low. The 21st meeting of the Trade Negotiating Committee which will meet in mid 2018 is expected to finalise a number of components of the FTA. As far as connectivity aspect is concerned, presently (in 2018), BIMSTEC Working Group is negotiating the Draft Test of the Motor Vehicles Agreement for the Regulation of Passenger and Cargo Vehicular Traffic between and among BIMSTEC Member Counties, for which a meeting was held in April 2018. Apart from boosting trade and investment in the region, the BIMSTEC FTA has an added advantage for India as it can help North East India to emerge as the main gateway of connectivity with India’s neighbours. As the largest country in the group, India can also offer liberal support to other member states in field of information and communication technology and human resource development. India can also act as main node of attracting investment from the world in the ‘hub and spoke’ model, where investment flow in India will be channelised to the smaller members of the BIMSTEC. This will boost the overall productivity and business in the region. In conclusion, it can be said that if BIMSTEC FTA is to deliver results, firm steps are needed by the member state to create a win-win situation. Saheli Bose is a student at the School of International Studies at Jawaharlal Nehru University, New Delhi. July 18th, 2018|Agriculture, Economy, Featured, Security and Foreign Policy|Comments Off on What has kept BIMSTEC from taking off?